Review Summary: On the whole REHNAA HAI TERRE DIL MEIN is a well executed love story but it will have to face stiff oppositions in the coming days. 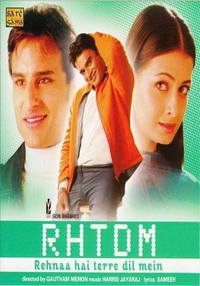 After the unexpected success of Mujhe Kucch Kehna Hai, Midas producer Vashu Bhagnani moves on to Rehnaa Hai Terre Dil Mein. On the whole REHNAA HAI TERRE DIL MEIN is a well executed love story but it will have to face stiff oppositions in the coming days. After Mujhe Kucch Kehna Hai, Vashu Bhagnani has come out with another enjoyable film--Rehnaa Hai Terre Dil Mein. Vashu Bhagnani’s latest offering fails to live up to all the hype surrounding it.